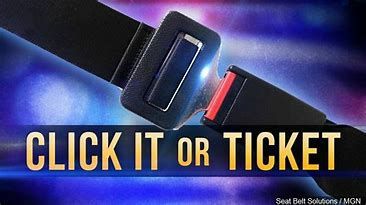 Law enforcement officers across the Rio Grande Valley will be on the lookout for drivers with unfastened seat belts when the national “Click it or Ticket” campaign starts today. The Texas Department of Public Safety, in addition to local police departments like McAllen, will deploy additional officers during the campaign, which runs through June 3, to stop and ticket drivers and passengers who aren’t wearing a seat belt. The goal of the campaign is to reduce traffic deaths and injuries that could have prevented by wearing a seat belt. Statewide, 929 people who died last year in car crashes were not wearing a seat belt, according to a DPS news release. Thirty-five people who died in car crashes in the Rio Grande Valley in 2017 were not wearing a seat belt, the agency said. The Texas A&M Transportation Institute found that more than half of all crashes where someone died and wasn’t wearing a seatbelt happened at night, from 6 p.m. to 6 a.m.
State law requires anyone in a vehicle to wear a seatbelt and violators face fines up to $200, in addition to court costs. Children under age 8 are required to be in child safety seat or booster unless they are taller than 4’9”, and the fine for improperly restrained children goes up to $250, according to DPS.